The Escape Artist at KP Projects is an opening which solidifies a formidable artistic direction, if not movement, of contemporary artists recalling a possession of innocence within their imagination. Possibly because of the tumult of the 21st century and its violent cacophony amplified by information technology, many artists are returning to the drawing board to almost distract from the harrowing vortex of worldly eventfulness. This is not to say that goodness in the world has been suffocated with blackness, only that the channels of communication which comprise mass culture are so saturated with the lowliness of synthetic melodrama, where human affair travesties worlds away are prioritized to be made more knowable over local charity and kindness, because, as Theodore Adorno suggested, this is the output of culture as a manufactured product. The mass man feels no drama in his mediocrity, and therefore can taste, safely behind a monitor or digital screen, the dangerousness of living life as a form of entertainment and excitation rather than as an element of his becoming. The artist is sensitive to this localized pressure which plausibly gives way to seeking refuge in the sweetness and the light of his oracular gift of presenting beautiful acumen to culture which is predominately profane in its current productive mode. 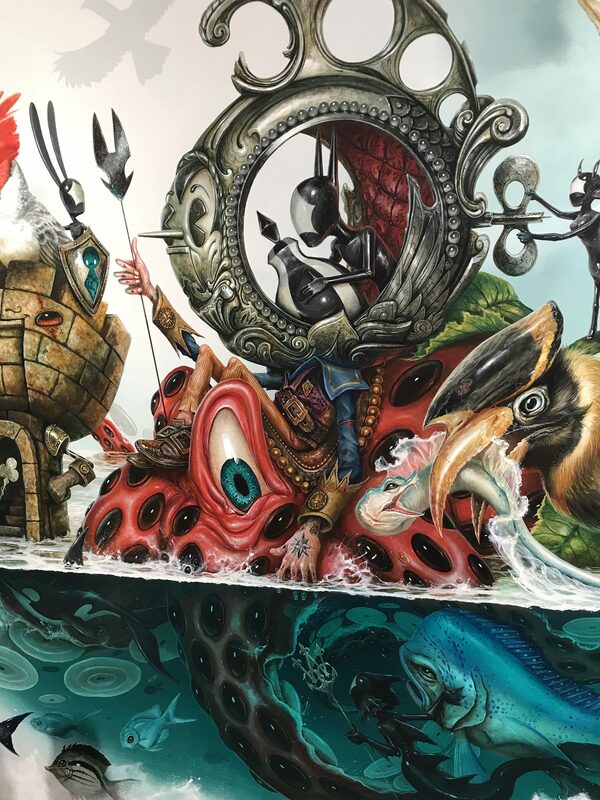 In The Escape Artist exhibition, Mr. Greg ‘CRAOLA’ Simkins imperiously resuscitates the target of Walt Disney and his immortal magical animated creations, by presupposing most of all worlds which are perfect in their own unique, albeit inexplicable, ways. Precious of all is the use of animals – avian in particular – to weave hyper-fantastical action scenes as if the still frames are capturing a typical life in the imaginative worlds. These are not phlegmatic universes but ferociously energetic, as much as ours if one were to take a step outside the boundaries of everyday life and appreciate the sheer energy that is hustle and bustle. But, they are elaborately imaginative, transcending our own observation of the natural world by imbuing us with a newfound sense of what is possibly imaginable – as all great art ought to. There is certainly danger, then, sensed in the most popular works exhibited. My Specialty is Special Tea, No Strings, and the titular The Escape Artist all possess the element of struggle and therefore the possibility of failure to overcome which is the hallmark of dangerousness. This dramatic tension, painted so masterfully and brilliantly in each, reels in the viewer who is seeking a resolution to this activated tragic potential. And yet in each surreal moment, we find relief. Despite the ostensible monstrosities and sheer weirdness crafted, upon closer scrutiny there is no harm being done. Yes, beasts of prey exist, but is that not a natural reflection of our own reality? Healthy spirits do not judge the natural world negatively, but positive and affirms its designs. Thus we see in the action set-pieces a warm-milk nourishment of our own world, and an affirmation of our existence and very being within it. This strikes even heartier with the welcome embrace of danger. As introduced, too commonly now mankind evades, runs, and flees from worldly deliverance, rather than stand still and smile at what comes its way – even further, to smile at the thought and the effort in overcoming the constant impediment to will power. This is where CRAOLA’s resonance with Disney is plucked so harmoniously. Disney acted as a pedagogue in delivering this encouragement for courage, the highest of cardinal virtues; without which, the propelling force of civilization falters and the project of raising mankind upward to the heights implodes. CRAOLA then entices and excites to taste the possibility of mortal wounds, as the truest fulfillment of being alive. If one is not taking a chance at being, one is nothing at all. And it is always better to be something rather than nothing.